In two and a half years of blogging I have been extremely fortunate not to have received any adverse or critical comments on my posts – until now. I think I would have been naïve had I believed this wouldn’t happen, and in a way I’m surprised it has taken this long. I think that if we choose to put our lives in our writing and to put our writing ‘out there’, even anonymously, we have to be prepared for the fact that some people will not only not like it or will disagree with us, but will also make that known in ways that are hurtful, unpleasant or aggressive. The comment in question was left on my post ‘Who do you call ‘mother’?’. The comment ‘informed me’ that my therapist is not my mother and that I should ‘deal with it’, and moreover that the reader had never heard anything more ridiculous. I haven’t published the comment – not because I want to censor negative comments, but because it was also scathing about my therapist. Not only do I strongly disagree with what was said about her, I don’t feel it’s fair to publish something to which my therapist doesn’t have the opportunity to respond. Although my blog is anonymous I’m still very careful to protect her privacy in any way I can; she didn’t choose to be part of my blogging journey. Receiving that comment was an unpleasant shock, and I’ll admit that despite the security I feel and the strength of the relationship I have with my therapist, it triggered a tiny voice which sided with the reader in accusing me of believing in an illusion. But that voice was easily dealt with by the other parts of me and by talking it through with my therapist, and the biggest effect of the comment was that it made me think again about the risks that we take and the responsibility that we bear, if we blog or if we read or comment on others’ blogs, particularly perhaps, in the field of mental health. I have always been a firm believer in the need to protect my therapy, in the way that I might protect a marriage or a friendship from temptation or threat. I am always conscious that although blogging can be a very positive means of self-expression, processing and ‘working things through’, there are also risks involved. There is a risk from myself, that I will do something to undermine and unsettle the work of therapy, and there is a risk from others, as was demonstrated by the comment I received. When we blog about our therapy, we are writing about the most vulnerable parts of ourselves, and about a unique and uniquely important relationship with our therapists. We are laying those things bare in front of an audience of unknown size and unknown characteristics – friend or foe, compassionate or scathing, hurting or wanting to hurt. We are fragile and yet with every post we take the risk that as well as being helped and encouraged, we could be harmed and torn down. We hope it is the former, but sometimes, regrettably, it is the latter. I am as open and as honest in my writing as I can be, but I do sometimes hold back, and it tends to be about the most intimate and precious things that happen in therapy. Sometimes I hold back because the moment feels too new and too private still, to share – it may never be shared, or I may write about it several months later. Sometimes I hold back because of that wish to protect my therapist’s privacy. Interestingly, the post that drew the negative comment, ‘was right on the edge of what I felt able to write about. This was because the subject matter felt so precious and intimate and therefore I felt even more strongly I had to be conscious of my therapist’s privacy. Perhaps the fact that I received that comment, shows that I did in fact ‘step over’ that edge, and my worries about intimacy and privacy may have been justified. This doesn’t mean that we can never talk to anyone else about what is going on in therapy, or that we can never write about it either. As Alison also wrote, “There is a difference between keeping a secret and holding on to something for the place it belongs.” For me, this means being very aware never to use blogging as a way of communicating with my therapist, when I should be talking to her instead. I will sometimes hold off writing or publishing a post if it concerns material that I have not yet raised with her in session. She reads my posts, and though I’m happy for her to read about my processing of material that she is already aware of (and where I don’t feel the need to do substantial further processing ‘in the room’), I would never want to raise ‘new’ material in a post, that she is completely unaware of. To me, that is a very important part of protecting the therapy and not undermining it, as well as ensuring that I don’t miss out on the opportunity to deepen the therapy relationship itself, and to experience everything it has to offer. For me, protecting the therapy is also about what I read, as well as what I write. There are a few blogs that I love to read but was determined to avoid over the summer therapy break. I knew I was likely to be particularly vulnerable to the parts of me that wanted to protest against my therapist ‘leaving’ and I was worried that reading about others’ therapeutic relationships, particularly if they were going through tough times, would be triggering. I have also read fewer books about therapy recently, as I know that I am tempted to look for ‘the right answer and the right way of doing things’, whereas there is no ‘right answer’ and I need to find my own way through. For example, I am for the moment avoiding reading about Schema based therapy, despite the great value I find in thinking of myself in terms of ‘parts’. I am worried that reading about it will divert the development of my own thoughts and finding the expression of this ‘parts idea’ that works best for me. Reading about others’ experiences can be comforting, valuable and supportive, but there is also the risk that it will introduce ‘interlopers’ into our own therapy, and that we will become involved in another’s difficulties in a way that too easily provides us with an outlet for our own. Both have happened to me, and in both cases the subject matter itself was valuable and significant. However, either it interjected itself into the middle of another important thread in therapy, where it landed out of the blue and in a bit of a vacuum; or it didn’t find authentic expression in our work – that is, I was using another’s situation to act out my own feelings about the topic, rather than drawing on my own experience. We have a responsibility to ourselves and our therapy to protect the work, but in reading and commenting on blogs, we also have a responsibility towards others. Much as I believe in protecting my own therapy, I also strongly believe in affirming and not undermining others’ therapy relationships and processes. I’m sure that sometimes I fail, and that sometimes I make less than helpful comments, even if I intend to be kind and supportive. But I try to remember that no one ‘on the outside’ can ever know what goes on in the room between therapist and client, however much detail a blogger gives in their posts. We read a tiny fraction of what is conveyed (in words or body language), remembered or spoken about, and we gain an idea of the quality of the therapeutic relationship that barely skims the surface. In addition, everyone’s process in therapy will be different, because of the individuality of the particular client and therapist and their unique interaction, as well as the client’s (and therapist’s) unique set of experiences. I also try and remind myself that what I read about in others’ blogs is necessarily one-sided and is the view of someone taking a journey and changing as they go, and that their needs and views will vary over time. For example, it is so natural to want to soothe a distressed fellow-blogger who is experiencing a rupture with their therapist, and to want to validate their feelings and show that I am ‘on their side’. But I sometimes need to remind myself that appearing to side with them (and by implication to side against their therapist), may not ultimately be helpful and may only undermine their therapy. Though I may not understand why their therapist has done or said x, y or z, I have to trust that, in the absence of any blatant evidence to the contrary, their therapist knows them and knows what they are doing, even if I or the fellow-blogger, cannot see the rationale at that particular point in time. I can still validate without ‘taking sides’. And the lovely thing about supportive relationships in the blogosphere is that like friendships, as they develop and as people get to know each other better, they also trust and are trusted enough to even be able to kindly challenge, where appropriate. I have often found my friends’ compassionate challenges even more helpful than their words of encouragement. But there was nothing kind or compassionate about the ‘challenge’ that I received in that blog comment. In a way though, I’m glad that I received it, as it ended up being incredibly thought-provoking. I won’t patronise the reader by speculating on their motivations or situation, or wishing them a different sort of experience. If they want to comment again, that is up to them – I can’t promise to publish it, depending on the content and who it is directed at. I’d be more than happy to engage in a discussion about whatever topic they wish – but with the proviso that we both take seriously the responsibility towards our own, and others’ well-being, and the power that our words have for good, or ill. Categories: Therapy | Tags: being responsible when writing comments on blogs, borderline personality disorder, BPD, negative blog comments, protecting our therapy, the risks of blogging, therapeutic relationship, therapy, undermining the work of therapy | Permalink. Categories: Therapy | Tags: borderline personality disorder, BPD, grieving what we never had as children, interalising therapist, therapeutic relationship, therapist as mother, therapist in the place of mother, therapy | Permalink. Who do you call ‘mother’? Two years ago I told my therapist I really wanted to show her the cuts from my recent self-harming. Though I wanted her to see, I never expected her to be open to seeing. I was asking for permission without expecting to be given it. She took me completely be surprise when she told me that if I wanted her to look, then she would. I could hardly believe it – I became flustered. I sat in silence, in indecision. I checked whether she really meant it, pointing out that the cuts were on my hips – a more ‘private place’ to expose, than my arms, for example. She did mean it; and I did show her. I treasure the memories of the powerful feelings of acceptance and closeness that came with that brief moment, at the end of a session. Two weeks ago I once again asked for a permission that I didn’t expect to receive. Sheepishly, hesitantly, I asked her if any of her clients had ever accidentally called her ‘Mum’ or ‘Mummy’. If she thought the question was strange, she didn’t say so, and she answered it as it was asked, saying something about not being sure, and having to think back…..I realised I was going to have to be more honest, and more direct. I admitted that the question was not about her previous clients at all; but that I often wondered what it would be like to call her those things, myself. Part of me really wanted to; part of me was also worried what would happen and what she would think, if I did so. I admitted, embarrassed, that sometimes when I had conversations with her in my head, I would use those terms – sometimes I would even speak them out loud, to see how it felt to say the words, imagining I was saying them to her. She smiled. I wish I could remember her actual words. But she told me that just as her biological daughters were free to choose how they addressed her, depending on what they felt comfortable with, the same applied to me, her therapy daughter. I love it when she calls me her ‘therapy daughter’ – but even the joy of hearing her refer to me in that way, was eclipsed by the surprise at her response. I said something like: “that’s really nice, in theory, but you don’t actually mean it“. I think she looked both amused and taken aback that I would disbelieve her and tell her what she did and did not mean! I tried to backtrack – I really didn’t want to offend her. “I’m sorry, I don’t know why I should be surprised. After all, my question was essentially about asking permission, and I wanted the answer to be yes. I don’t understand why I should be so surprised, why it should be so unexpected…..”. Once again, as happened two years ago, it was the end of the session and the moment passed all too quickly. But my mind continued to ponder the significance of the moment, while my heart and body absorbed the emotions and the sense of acceptance, warmth and safety that flooded through me. I realised that my question, my seeking permission, was coming from a part of me that still expected there to be limits to her caring and acceptance. A part that doubted she offered something unconditional, and that expected there to be a point beyond which I was ‘too much’ for her. It came from the part that feels untouchable and off-putting – and sees that as the reason my therapist won’t hold me in session, rather than the fact that she simply does not use touch in therapy. It came from a part of me that thought: it’s all very well her being happy to call herself my ‘therapy mother’, but surely the analogy only goes so far – surely she would never actually allow me to call her ‘mother’. However, to use the word ‘allow’ is to revert back to thinking about things in the way that my own mother trained me to, because she was very specific in how she would let me address her. And as for the ‘therapy mother/therapy daughter’ relationship, it’s not an analogy, it’s a reality. The only reality to some mother-daughter relationships is their biological reality – I’m lucky enough to have a mother-daughter relationship which is real in so many other, non-biological but significant ways. It’s staggering to know that I have the freedom to call her what I feel comfortable with – just as her daughters do. I know that she knows I’m not going to start referring to her as ‘Mum’ from here on in – but I don’t think that makes her ‘offer’ any the less genuine. I haven’t yet exercised the freedom she has given me – at least, not directly, though I do still ‘try out the words’ at home, particularly when I’m distressed and want to ‘call out to her’. Perhaps I never will take her up on it, though I’d like to – I’d really like to. But it’s enough to know that I can – that I’m accepted and acceptable, and not just ‘up to a point’. The therapy relationship may be boundaried and circumscribed in a particular way, but that’s because it has to be; it’s not in order to keep me out or at a distance, or because there’s a limit to how much of me my therapist can or wants to ‘put up with’. A few days ago I showed her some fresh marks where I had succumbed to self-harm again, after a fairly long period of holding back from cutting. It was the first time I’d shown her my self-harm since that first time, two years ago. It felt comfortable and safe – there was no question in my mind about how she would react or whether she would be compassionate and accepting. I imagine that if I ever summon up the courage to call her ‘mother’, I will be a little hesitant, and it will feel a little strange. But after the conversation we had a couple of weeks ago, I’m no longer worried about her response. I dare to hope she may even smile and feel a little pleased! In the meantime, the memory of that conversation is precious and it’s become a part of the view I have of her as ‘new mother’. But it’s also become part of the view I know she has of me; and therefore of the view I am trying to develop of myself. I still find it incredibly difficult to keep in mind the intended end-result of therapy – that I will come to think of myself differently. But moments like these are so significant because they give me an experience of being attended to and being seen in an entirely new way; and just as the ‘old ways’ of being attended to shaped a particular view of myself, so this ‘new way’ of being seen will hopefully give me, in time, a different perspective on who I am. I’m looking forward to finding out more about who this ‘therapy daughter’ really is and can become…. Categories: Therapy | Tags: being a therapy daughter, borderline personality disorder, BPD, intimacy and closeness in therapy, therapist as mother, therapy, therapy relationship, wanting to call my therapist mother | Permalink. The theme of World Mental Health Day 2016 is ‘psychological first aid’. This can come in many forms, and though the emphasis on this day is on what others can do for those in distress, it’s worth remembering that at the times when we are able to practice it – and it won’t be all the time, or even when we need it most – self-compassion is an important type of psychological first aid that we can administer ourselves. This evening I was re-reading portions of Rachel Kelly’s excellent book ‘Walking on sunshine: 52 small steps to happiness’, and I was struck again by her ‘last step’, step 52, entitled ‘Unhistoric acts’. Apart from giving away the ending of Middlemarch (I’m ashamed to admit I haven’t yet managed to read it! 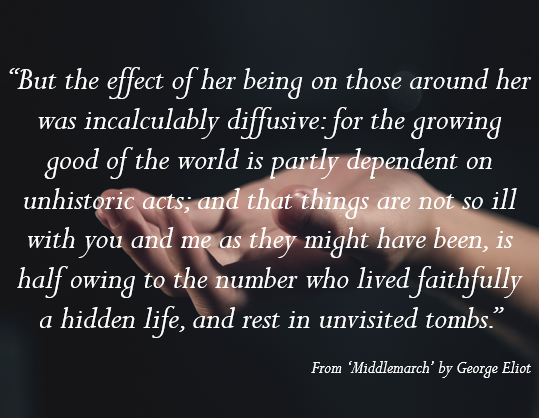 ), the chapter points to the wonderful quote above, which reflects the impact that the heroine of the novel had on the people around her and, to quote Rachel Kelly, it shows “the value of those small – but immeasurably important – acts that may go unnoticed, but can be crucial for our wellbeing and that of others”. We can all administer psychological first aid – greater information and understanding about mental health conditions can of course help – but we are all capable of ‘unhistoric acts’ that can change lives and make a significant difference to those around us, and particularly to those in distress. Many of us will have been recipients of such unhistoric acts, whether from friends, family, therapists, ministers, colleagues or strangers; and we know the difference they have made. The acts may be known only to the two people involved – and sometimes only the recipients are aware of their effects; but their impact is as much for the good of the world, as it is for the good of an individual. When it comes to unhistoric acts and the growing good of the world, we are all transformed – whether by the giving of compassion, or the receiving of it. Categories: Poems, quotes and music | Tags: borderline personality disorder, BPD, george eliot middlemarch, helping others in distress, mental health, mental health first aid, psychological first aid, therapy, unhistoric acts, WMDH16, world mental health day 2016 | Permalink. Sometimes I worry that if I lose a train of thought in session, or if I change subject or direction, I may not be able to find my way back or I may leave a topic ‘unfinished’. My therapist replies that if something is important, it will come round again in session, in one form or another, so that we ‘can take another bite at the cherry’. Over the last few months it feels as though I have made significant progress in therapy, and there have been a number of key components to that progress. These include the way in which I now think of myself as composed of a number of ‘personas’ (or parts), my ability to see my therapist as a ‘new mother‘ figure who I can relate to independently of how I related to my biological mother, and the honesty and vulnerability with which I am now often able to approach sessions, precisely because I am much more aware both of ‘new mother’ and the different parts of me that might try and oppose her. In thinking of that progress I am struck by how often the core elements of these ideas and concepts were already present in my therapy some time ago, but had not had the impact they have had recently. In some cases I even believed I’d had a ‘light-bulb moment’, and yet still it hadn’t had a significant change on my behaviour. It is as if I had realised I’d found an important piece of the jigsaw, but until enough of the pieces were in place, I couldn’t see or understand the bigger picture. And once enough pieces were in place, the speed with which others could be slotted in, was magnified. The post describes the moment when I fully realised the enormous extent to which I routinely censored my thoughts in therapy. It also describes how, in the absence of communicating how I felt, I often ‘acted it out’ instead. Though these seemed like important insights at the time, I continued to censor my thoughts, though perhaps not quite so heavily, and I continued to ‘act out’, though not quite so blatantly. And it’s only now, more than a year later, that I can really see that that has changed. In Part I of the post I wrote: “Judgement, lack of interest, intrusiveness. All of those past experiences make it hard to talk in therapy. But their absence in therapy makes it equally hard to talk. My therapist is not intrusive, she doesn’t judge me, and she is genuinely interested in me. But I have no idea how to operate in that environment…”. The difference now is that I see my therapist not just as not judgmental or intrusive – but as not my biological mother. I see her as ‘new mother’, and that frees me up to operate completely differently with her, and to speak without fear, and with confidence of acceptance. In Part II of the post I wrote: “As this wonderful quote says: ‘In a corner of my soul there hides a tiny frightened child, who is frightened by a corner where there lingers something wild’. The difficult thing about therapy, is realising that the frightened child and the ‘something wild’ can both be parts of ourselves. When we start talking about them rather than acting them out – perhaps then we can start to integrate them into our view of ourselves, and to accept them. And perhaps then there will be no need of a mask to hide behind; at least in therapy, and to ourselves.” The difference now is that I have started to identify and integrate the different parts of me, and to talk about them and accept them. It is an ongoing process, but it does mean that there is much less ‘acting out’ either in or between sessions, and much more openness in talking about how I really feel. There is a one small part of my most recent therapy session that really shows how the censorship described in both parts of my earlier post, has changed, for the reasons described above. I have had a run of difficult sessions in which I have been barely able to talk, with a large part of me feeling resentful and resistant and not really wanting to turn up to therapy at all. The (small and barely audible) non-resistant part of me managed to say ‘this reminds me a little of how things were at university‘, to which my therapist replied, ‘can you say a bit more about that‘? With only the smallest of pauses, I simply said ‘What just went through my mind was – no, because I don’t want to talk to you‘. There was momentary censorship – after all, I could have immediately spoken the words that went through my mind. But when I did speak them, it was with confidence and trust, rather than fear, and that’s what made the censorship momentary – rather than ongoing and solitary. Categories: Memory Monday, Therapy | Tags: borderline personality disorder, BPD, censoring thoughts in therapy, free association, speaking freely and with vulnerability in therapy, therapist as mother, therapy | Permalink.